On the day Cypress Hill released “Band Of Gypsies” — the first video from the group’s upcoming Elephants On Acid album — B-Real was at the B-Real TV studios in Los Angeles working on one of his other endeavors. His tireless work ethic has landed him in the Hip Hop history books alongside his Cypress Hill brethren. As the first Latino Hip Hop outfit to reach multi-platinum status, Cypress Hill has been breaking down barriers since its 1988 inception. Thirty years later, DJ Muggs, Sen Dog, Eric Bobo and B-Real are ready to drop their ninth official studio album, the group’s first LP since 2010’s Rise Up. With Muggs back in the production chair, Cypress Hill enacts the same formula that made 1991’s self-titled debut and 1993’s Black Sunday resonate with so many people. 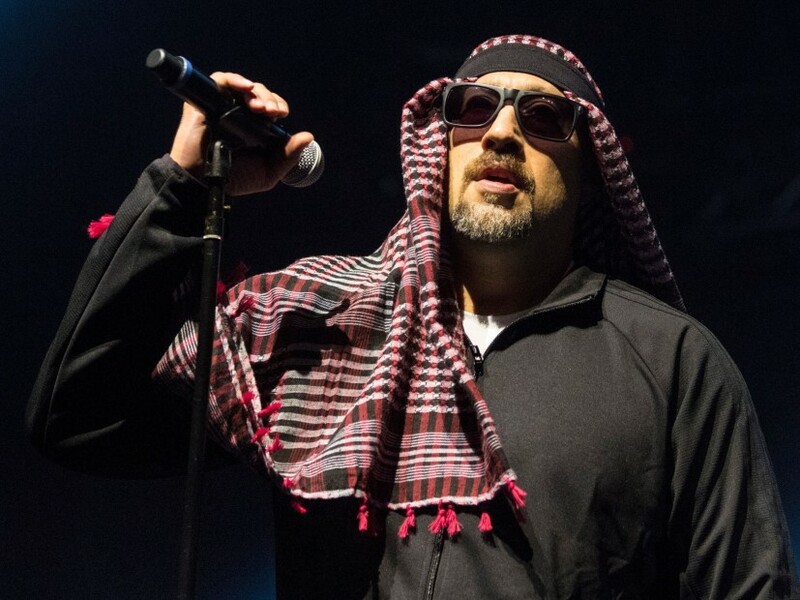 During the eight years since Cypress Hill has been on hiatus, B-Real launched Prophets Of Rage with Chuck D, Tom Morello and other members of Rage Against The Machine, while Muggs has been involved in numerous projects, including 2017’s Gems From The Equinox with Meyhem Lauren and his recent Assassination’s Day collabs with DOOM. It took time to put the final touches on Elephants On Acid, but Muggs finally got to a place where he was ready to unveil it. “Muggs is someone who wants to dial it in completely, the way he wants to hear it,” B-Real explains. “He may change his mind a few times and tweak a few things, so it’s just one of those things where we put a bunch of work into it and it comes out when he feels comfortable with it. The growth on their new material is evident. Lyrics about gang banging and getting high doesn’t dominate their music like it once did. In 1995, Cypress Hill was asked to make a more radio-friendly version of the single “Throw Your Set In The Air,” which detailed the inner workings of gang life. “We were only getting so much love from radio because of what the song was about, which was basically a story on getting inducted into a gang and the chorus is ‘throw your set in the air,’ right? The original version of the track, which appeared on the platinum-selling Cypress Hill III: Temples Of Boom album, also caused a temporary rift with Ice Cube. B-Real invited the N.W.A legend to the studio one day and played him some of the songs Cypress Hill was cooking up at the time. There, Cube heard the chorus for “Throw Your Set In The Air” and allegedly stole the hook for his own smash hit, “Friday.” But that’s bong water under the bridge. B-Real has another solo album in the works with esteemed producer Scott Storch as well. It will mark his official follow-up to 2009’s Smoke & Mirrors. Elephants On Acid is expected to arrive on September 28 and a tour in support of the project will follow. This time, Mix Master Mike will fill in as the tour DJ. It’s a relationship that started before Mike even joined the Beastie Boys. “Mike’s been our friend for a long time and we’ve been fans of his since he was just doing DJ exhibitions and what not,” he says. “We’ve known of his skill set for quite some time and when he joined the Beasties, we were like, ‘Wow!’ because what he added to their show, no other DJ was doing stuff like that. To close out 2019, Cypress Hill will also unveil their star on the Hollywood Walk Of Fame. The Hollywood Chamber of Commerce announced the news in June.